What could be worse than being struck down with vomiting, chills, and a sore throat? Having your whole family treat you like a leper while you’re suffering from all these symptoms! Anyone who has had the flu can tell you how miserable it is, and when you’re sick, it’s nice to be taken care of. You want someone to bring you chicken soup in bed, pile on the blankets when you’re chilly, and put a cool cloth on your head when you’re feverish. But if you’re a family member witnessing the misery of your sibling, parent, or child, the last thing you want to do is get up close and personal. 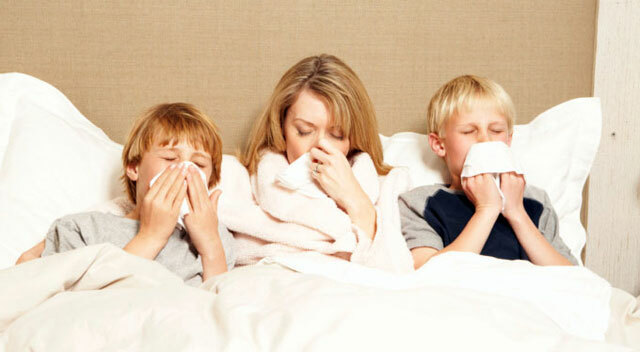 How can you take care of a coughing, runny-nosed family member without becoming the flu’s next victim? You could always lock the sick person up in a room and only open the door for meals, but that’s a little drastic. Instead, take active steps to keep yourself healthy while carefully nursing your loved one back to health. Wash your hands frequently, and avoid touching your face, particularly your mouth and eyes. Don’t get too close to the sick person’s face, in case he or she has to sneeze or cough unexpectedly. If you have one oral thermometer that is shared by the whole house, wash it with soap and water after each use. You can encourage recovery by bringing food to the sick person, so he or she can rest in bed. Keep a constant supply of water. Hydration is necessary for good health. Ensure your patient’s comfort by providing a stack of blankets that he or she can use as needed, and have a bucket handy in case the person needs to vomit unexpectedly. It’s no fun when someone in your household gets sick, but by the time one person has the flu, it’s a little late to rush out and get vaccinated (although you should anyway, so you don’t get sick later in the season!). It takes about two weeks after you get the flu shot for the antibodies to develop and protect you against the flu, so get everyone in your family vaccinated as soon as possible. If this year is anything like last year in Tolleson, when Forbes cited Phoenix as one of the worst cities for the flu, you’ll want that protection! At FastMed Urgent Care in Tolleson, we’re offering $25 flu shots. There’s no appointment necessary, and we’re open seven days a week. Just stop by our location at 9870 W. Lower Buckeye Road. As this Phoenix case illustrates, even the healthiest people can become severely ill from the flu. Protect your family today by getting vaccinated at FastMed Urgent Care of Tolleson.